I remember when I was just a little kid and my Grandma Phyllis took care of me every day after elementary school while my parents were at work. She sat me down and made sure I did my homework. She snuck chocolate cupcakes to me and made me promise not to tell my grandfather because those were his favorite. My grandma taught me how to ride a bike down the same street where she taught my dad how to ride. She read my favorite books to me over and over again without getting tired because that was her kind and loving personality. But she’s gone now. She is still living but she is no longer with us. She is a shell of her former self and I never told her how much I appreciated everything she did for me. My family has been torn apart because of disagreements and arguments about her care and finances. Alzheimer’s hasn’t just taken my grandma; it has broken apart and stressed my family, limited my grandpa’s ability to retire anytime in the near future or live happily and healthily, and taken the ability for my grandma to know how much I love her. But we do not just fear for her healthy and safety. 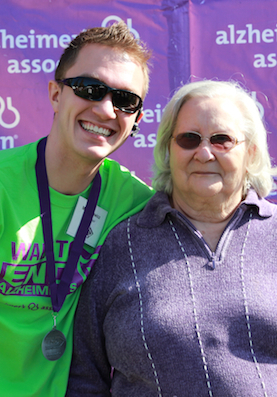 It is quite likely that Alzheimer’s runs in my family. My dad fears everyday that his brain will cause the same problems in our immediate family as it has done to my grandmother’s. With the great leaps and bounds we have taken in our research and technology, I have hope that Alzheimer’s Disease will end at my grandmother’s generation. But we aren't there and we need your help. Help me raise money so that other families don't have to go through what mine has. 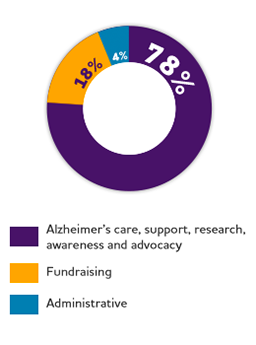 Your donation will help stop Alzheimer's in its tracks.